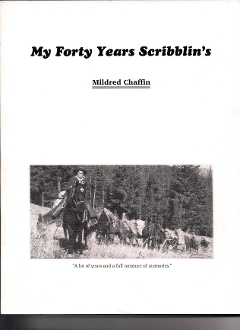 Mildred writes,"My writing career began at age nine. Teacher couldn't find a part for me in the Christmas program so I wrote one and she let me use it. The seed lay dormant until I landed a job as stringer with the St. Ignatius Post. When we moved I decided the Missoulian needed a correspondent from Seeley Lake so I took a deep breath and wrote them a letter. To my surprise they accepted, but here was a mondey of a different stripe. They put up with my shortcomings while I learned a few things about newspaper writing. Two years work produced a cook book, and at the instigation of my kids, I published a book about my own life, Once Upon a (Life)time. After several years of news, features, and magazine articles, I realized that historical non-fiction was my best bet, and to everyone who supported me and my projects I extend a heart felt "Thank you."